This is a government bus, no A/C and crowded enough during rush hour traffic that people will hang out the doorways. Literally. And the bus doesn't exactly come to a full and comlete stop all the time – usually a rolling stop does the trick, it seems, with people hurriedly jumping off or strugging to climb on. And then I realize that there's a whole lot of other information that needs to be added. There are public, or government-run, buses and there are private buses. They run on the same bus routes. The government buses are the cheapest and the most crowded from what I've seen. The private ones tend to have A/C and may cost twice as much as government buses, give or take, and have more comfortable seating for some values of comfortable. Government bus fares are subsidized by the government. When you use a bus, you're not contributing to the local economy. If you take a trishaw or cab, you are contributing to the local economy, directly into the hands of those who can use the money. Also, a trishaw or cab will be miles more comfortable and get you to your destination much more quickly. And, if you're female, you're much more likely to be sexually assaulted on a bus than in a trishaw or cab. Worth knowing. 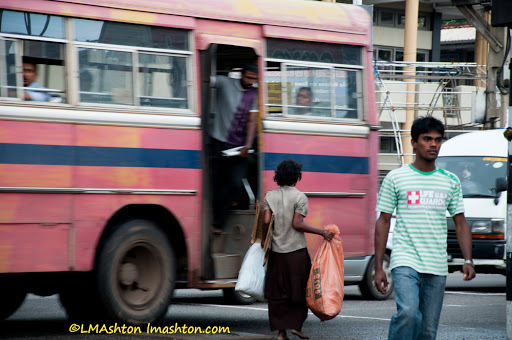 Those are all fantastic reasons to not ride a bus in Sri Lanka. I am all for helping out the local economy wherever I may be.